Cook&Becker has done it again, after all the great artworks for games such as the Last of Us, Killzone, Okami, Journey and Mass Effect they have now entered the world of art books! Killzone Visual Design: Celebrating 15 Years of Killzone is the first comprehensive overview of the visual development of the million-selling Killzone video game series. With unlimited access to the image archives of game studio Guerrilla and the people involved in making Killzone, compilers Cook & Becker and Arjan Terpstra unearthed images and stories from fifteen years of unique visual design. This 208 page art book gives a detailed, illustrated account of the idiosyncratic design philosophy behind the Killzone video game series, the beautiful concept art used to create the Killzone universe and the amazing attention to detail Guerrilla bestows on its games. 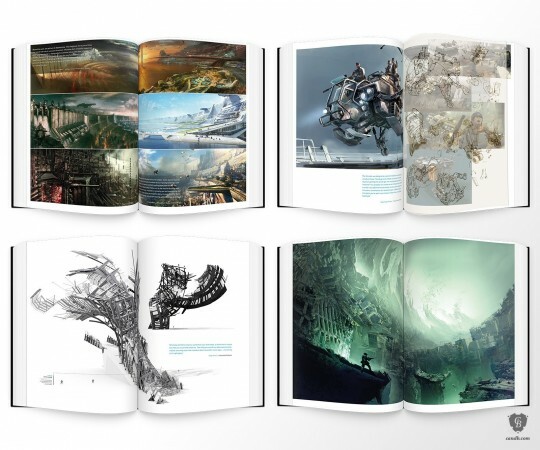 From early hand-drawn concept art used for the first Killzone game to awe-inspiring in-game renders from Killzone Shadow Fall: this book truly celebrates the talent and skill of Killzone’s makers. This coffee table art book will inspire fans and anyone involved in visual design – be it video game design or any of the other design arts. 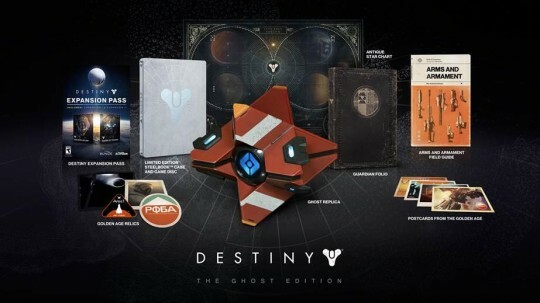 The book features an opening statement by Guerrilla studio director Hermen Hulst and President of Sony Worldwide Studios Shuhei Yoshida. 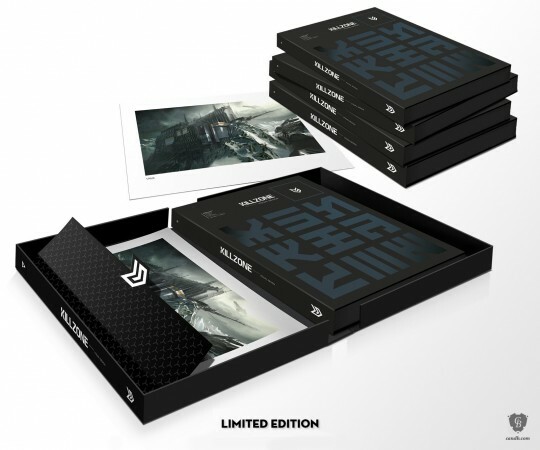 Killzone Visual Design: Celebrating 15 years of Killzone is available in a special Limited Edition and an open edition Standard Hardcover. The inside of both books is identical. Limited to a 1.000 hand-signed copies. Includes hand-numbered Killzone concept art giclee print “Stahl Arms”(30 x 23 cm Certified Art Giclee™ printed on 270 gsm. Radiant White using archival inks). 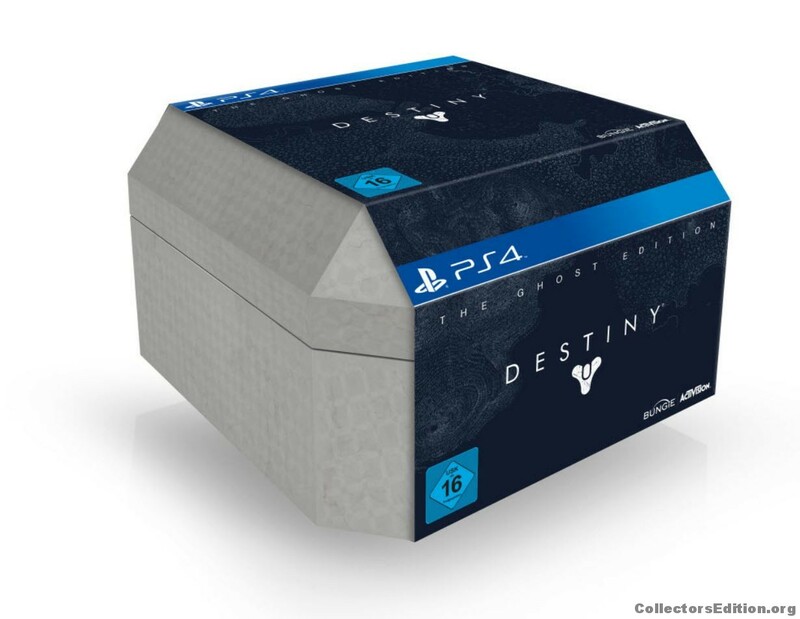 Comes in a luxury box. Warner Bros. and NetherRealm Studios have announced two “Kollector’s Editions”, one Premium Edition and one Limited Edition for the upcoming fighting video game Mortal Kombat X. 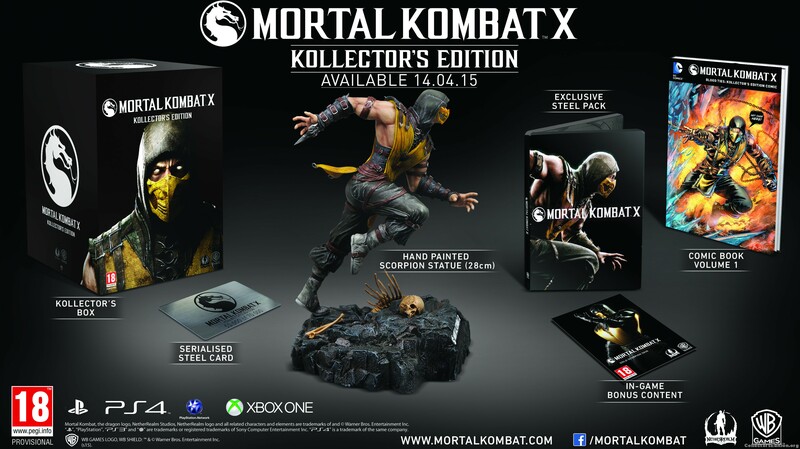 Both Kollector’s Editions are only available for PS4 and Xbox One and will be available in Europe and North America this April. 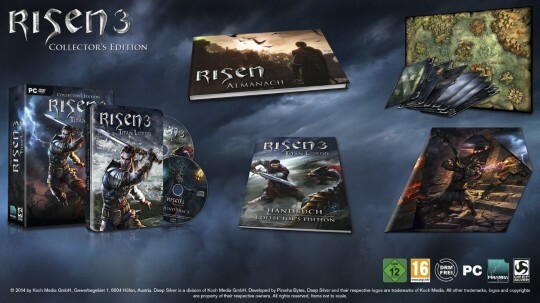 Finally, there’s the Premium Edition which is download only. 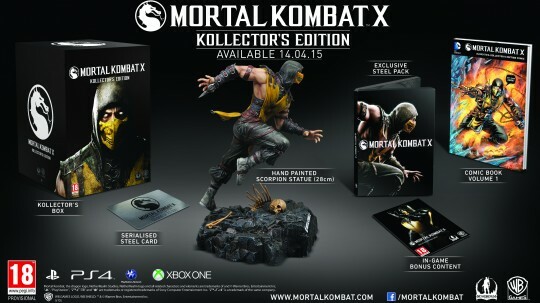 It includes the Kombat Pack and costs $90 for PS4 & Xbox One. Kingdom Hearts HD 2.5 ReMIX Collector’s Edition Announced – US, UK and France Only! 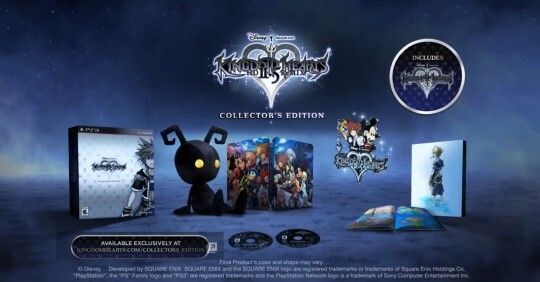 Today, Square-Enix has announced details of the Collector’s Edition of Kingdom Hearts HD 2.5 ReMIX. The HD 2.5 REMIX is a remastered compilation of Kingdom Hearts II Final Mix and Kingdom Hearts Birth by Sleep Final Mix and will release in North America on December 2nd and Europe on 5th December 2014 exclusively on the PlayStation3. 30-page art book – This art book includes a brand new never before seen sketch from Kingdom Hearts series director – Tetsuya Nomura. With 30 pages of artistic goodness covering concept and finalized artwork of heroes, villains, worlds, and weapons, this artbook also includes concept animation storyboards from Kingdom Hearts Birth by Sleep and Kingdom Hearts Re:coded. The front and back cover were designed to mirror the artbook from the Limited Edition of Kingdom Hearts HD 1.5 ReMIX, so if you’re a true collector, it’s definitely not something to *ahem* Birth by Sleep on. The only way to obtain this artbook will be in this Collector’s Edition! Exclusive Disney collectible pin – Perfect for you Disney pin badge collectors or those that like to collect Kingdom Hearts merchandise, this pin which is manufactured in limited quantities features Sora and Mickey Mouse back to back, with the iconic keyblade and a Mickey Mouse dangler. Made out of a soft enamel coating on metal, this pin stretches out to 1.68 inches. The best of the lot is probably the Shadow Heartless plush toy if you ask me but with the addition of the art book and the Steelbook there is something for every taste. 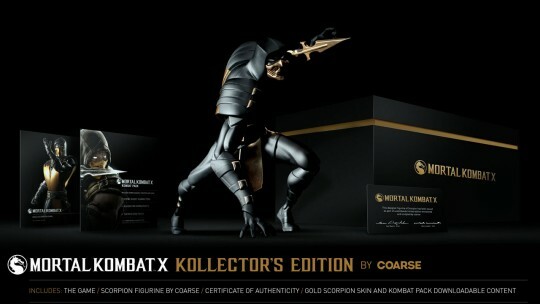 The Collector’s Edition is up for pre-order at the SE boutique for France, UK customers please check back here and everyone from America please click here. 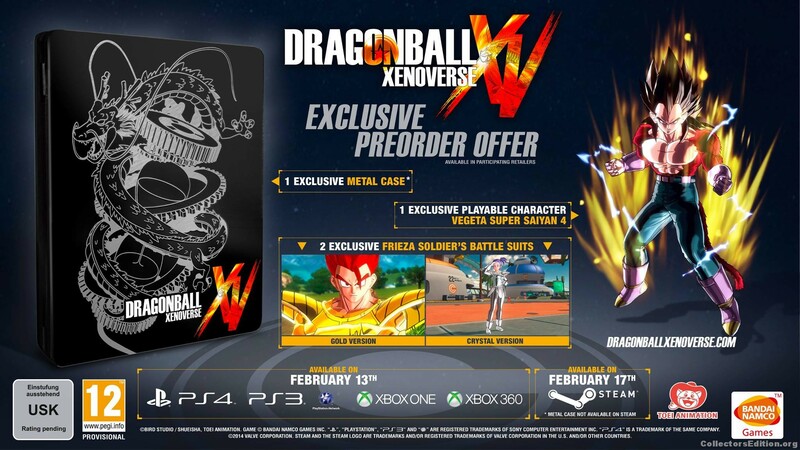 Today, Bandai Namco have announced that the upcoming fighting game Dragon Ball Xenoverse is out on 13th February for the Europe and Oceania regions on PS3, X360, PS4 and XB1. 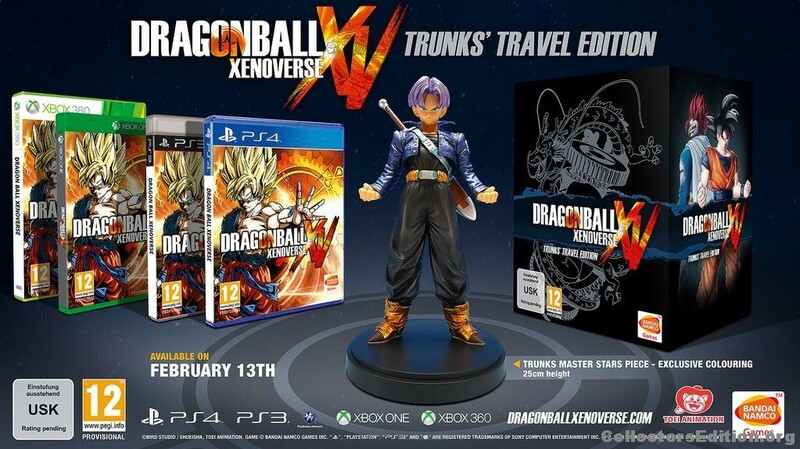 But that’s not all that was announced as we also got words on a Collector’s Edition called Trunks’ Travel Edition which will feature a 25cm Trunks Master Stars Piece figure with exclusive colouring. Dragon Ball Xenoverse is also launching on Steam but the Trunks’ Travel Edition is for consoles only. Uncharted Certified Art Giclées, now available to order at C&B. It is a good year for Naughty Dog and art fans. 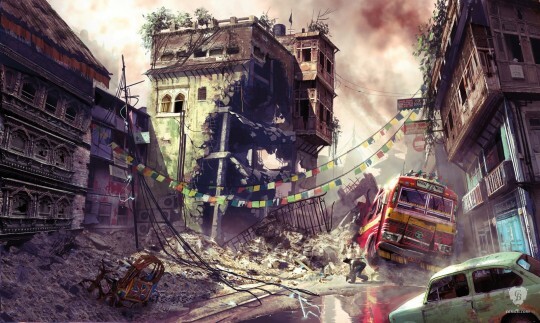 Celebrating Naughty Dogs 30 year anniversary, art gallery Cook & Becker presents a collection of limited-edition fine art prints based on the concept art & the visual design of the Uncharted Trilogy. We could already admire uncharted concept art in the just released Naughty Dog artbook, but now we can also hang some of the amazing concept art on our walls. Here are just a few examples of the artworks. 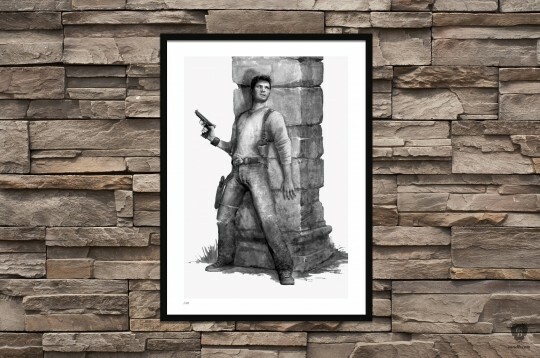 The prints are museum-grade Certified Art Giclees™ and are meant to showcase the visual design of the Uncharted franchise in the best possible quality. All prints have been extensively proofed by the artists at Naughty Dog and Cook & Becker’s master printer to get as close to the digital source as possible. 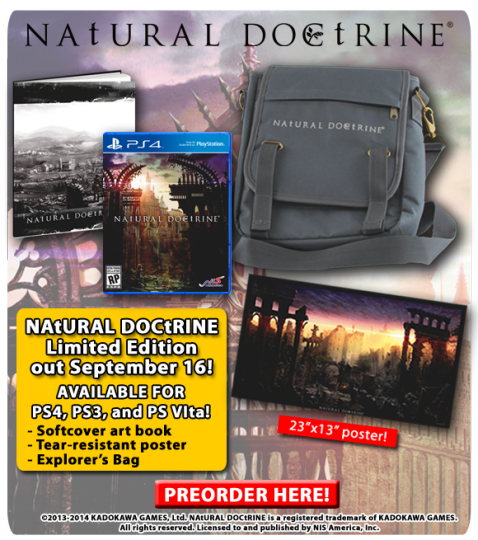 All prints are hand-numbered, embossed with the Naughty Dog logo and have a digital signature. Some prints are also hand-signed via label and certificate by the artist aswell. 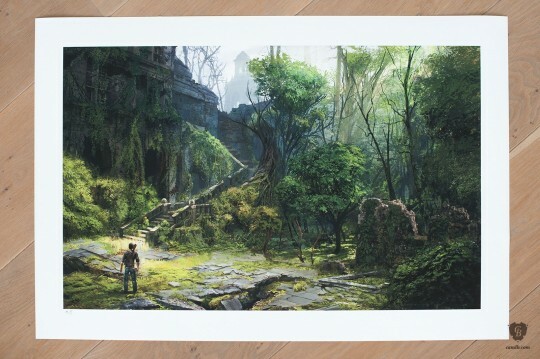 Not all prints could be signed by the artists as some artists are not with Naughty Dog anymore. All artworks are available now via Cook&Becker. Sony has announced during their E3 2014 press conference a special partnership with Disney which will bring exclusive Disney Infinity: Marvel Super Heroes 2.0 content to PS4. 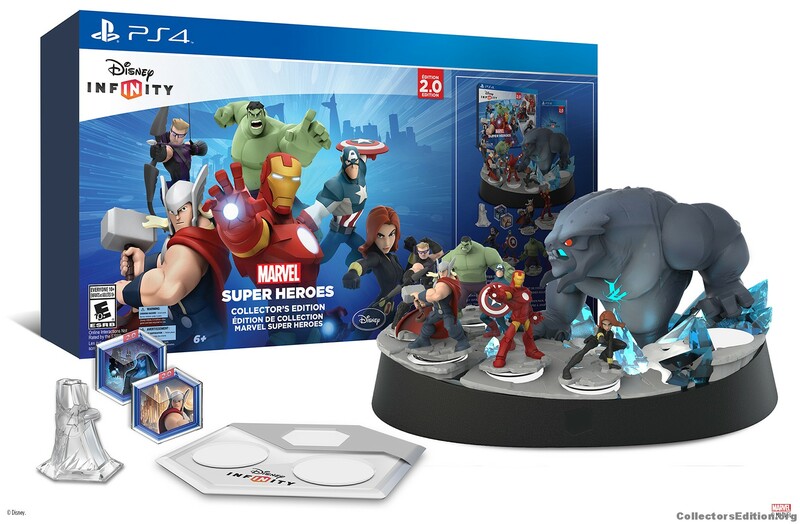 Since then Sony and Disney have been extremely quiet on the subject but now John Vignocchi, executive producer on Disney Infinity official announced the Collector’s Edition for Disney Infinity 2.0: Marvel Super Heroes. 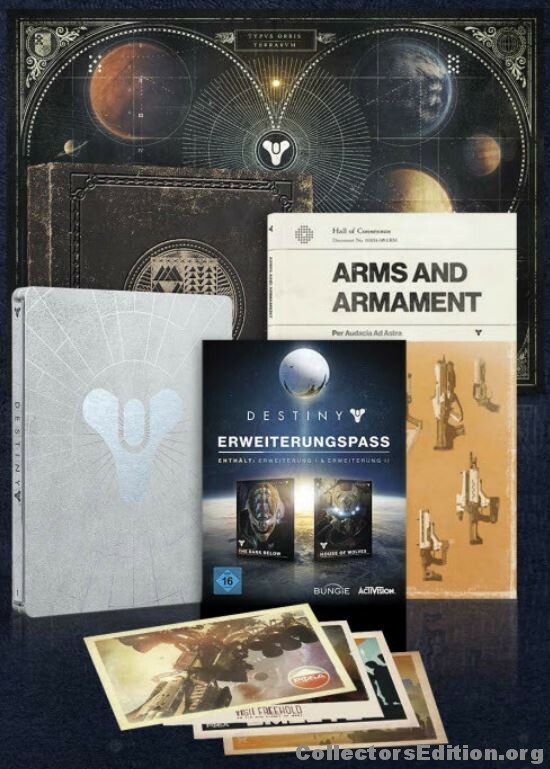 pre-orders can be placed on Amazon UK & Gamestop.com with a release date set for September 19th in Europe and September 23rd in North America. Thanks to ce.o member Resseh for the heads up! 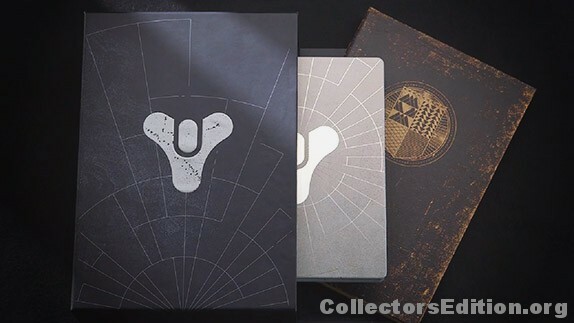 It’s Bungy Day today, and the developer has announced two different physical Collector’s Editions for their highly-anticipated videogame Destiny. You can check ’em out below. “Arms and Armament” Field Guide: Many believe the weapons and armor featured in this record are a myth. You will learn the truth. Postcards from the Golden Age: Our worlds have been claimed by our enemies. Now, it’s time to take them back. Antique Star Chart: Explore the wild frontiers of our solar system. Discover all that we have lost. Ghost Replica: This is your motion-sensing Ghost, featuring lights and audio from the game. May it lead you through the Darkness. Letter of Introduction: These worlds were once ours. If you accept your destiny, you will be asked to do the impossible. In the UK the Ghost Edition is exclusive to Game UK. Thanks to ce.o member KnightOfTruth for the heads up! NIS America have just announced the release date of their upcoming game NAtURAL DOCtRINE and now they are already taking pre-orders for the Limited Edition of the game. The tactical role-playing game by Kadokawa Games will be released physically and digitally on September 16 in North America and September 19 in Europe for PS3, PS4, and PS Vita. Also a NISA Europe Online Store will be going live July 1 (presumably with these Limited Editions) Because of this, the NISA Online Store will no longer be shipping to customers in the PAL region. Thanks to ce.o member rapister for the heads up! 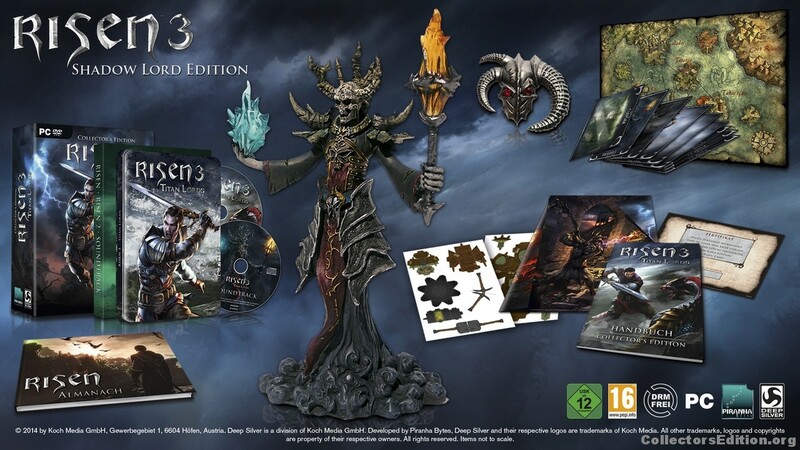 The Shadow Lord edition will be exclusive to amazon.de in Germany, and some retailers on Austria and Switzerland (yeah!). 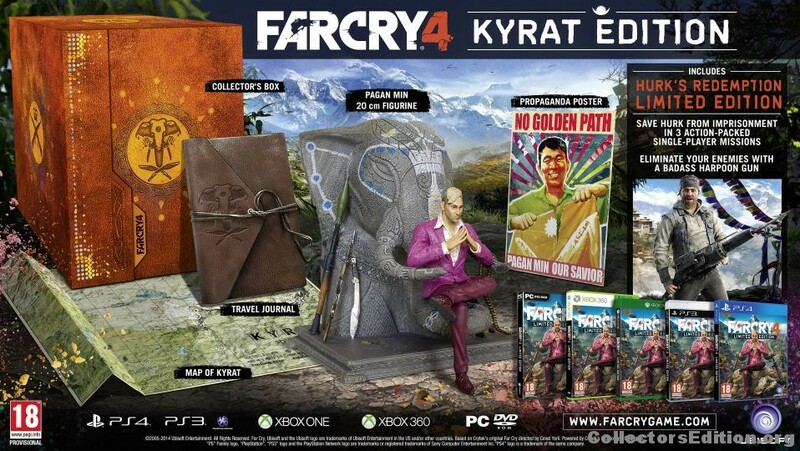 According to Deep Silver, the Shadow Lord Edition will be “strictly limited” (no numbers given though). Enjoy! Thanks to ce.o memeber Letrico for the heads up!